Have you ever noticed how many serious academic bloggers are addicted to science fiction? Hardnosed researchers of evolutionary biology, or analytic philosophy or even critical theology will throw in regular posts about the latest Dr Who or Star Wars story. That got me wondering why magic remains so popular in fiction, in an age when nobody believes in magic. For science fiction, after all, is only really the supernatural set within pseudo-science rather than demonology (if you don’t count Phillip Pulman or Terry Pratchett, where it is set in demonology). As the introduction to one of the sci-fi anthologies on my shelf says, a story beginning “The last man in the world was sitting reading, when there was a knock at the door” would have been a ghost-story in the nineteenth century, but is science fiction now. I did a post on magic in relation to the rise of science. But that was about real magic – early modern scientists sought to harness occult (natural or spiritual) forces to their wills. The role of magic in fiction has run an entirely different historical course, which is intriguing. The main difference, it seems to me, is that real magic is about power, whereas fictional magic is about meaning. Real magic, in the times of early Christianity, was largely the domain of those seeking control over others through hi-jacking the powers of divinities and sub-divinities to whom they were not necessarily devoted (cf Act 9.13-20). By the ninth century or so, magic and witchcraft were not simply outlawed by the Church – they were dismissed as fraudulent. It was the Renaissance intellectuals who dragged them back into circulation from Greek sources, and their natural philosophers who sought to use magic in both its “natural” and “spiritual” forms practically. 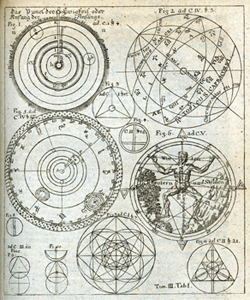 Newton was an alchemist; Galileo one of the most celebrated astrologers of his time. It is possible that the witch-hunting craze of the sixteenth and seventeenth centuries was fallout from that academic background, cross-infecting the Church with its beliefs and fears – they were the same intellectuals, with identical university educations, after all. The anti-supernaturalism of the Enlightenment has, overall, held the intellectual ground until now, despite aberrations like the nineteenth century vogue for spiritualism and new religions (posing as old) like wicca in the recent past. Fictional magic was always of a different character. How much it was ever embraced as “real” is doubtful. Much stress is laid now on the superstitious gullibility of the readers of mediaeval tales of dragons and sorcery, but should one not draw the same conclusions about the present, given the runaway popularity Lord of the Rings, Harry Potter, Avatar, Buffy the Vampire Slayer, X-Files, Superman, Lovecraft’s Cthulhu mythos etc, etc, etc? I suggest that magic in stories served the same kind of purpose in ancient times that it does now – which has to do with understanding the meaning of the real universe. For while serious Christian theology was debunking witchcraft, Christian writers were happily including it in fiction. Beowulf takes figures of Norse mythology, like the troll Grendel, and pits their magic aginst the virtues of the righteous, glossing the text with thoroughly Christian references. 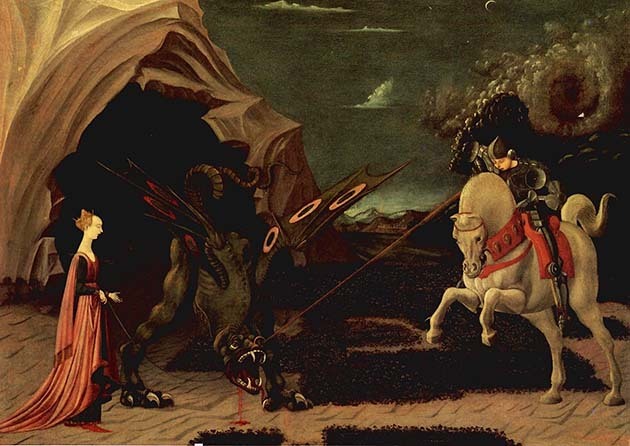 Mediaeval tales of dragons, like the Lambton Worm or St George, are essentially allegories of the war of the saints against “that ancient dragon, Satan”. Fast forward to the fourteenth century, and alchemists were busily trying to harness occult powers they believed to be real (see the rather squalid reality represented in Chaucer’s Canon-Yeoman’s Tale – all about greed, disillusion and intrigue). 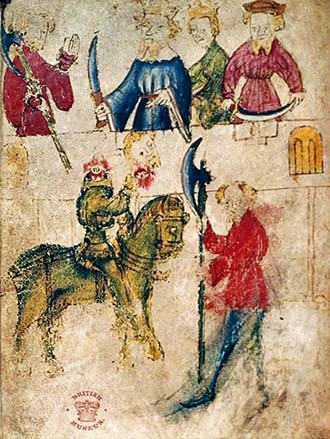 But in Sir Gawain and the Green Knight a completely different, more romantic, magic plays out Christian-chivalric themes of good and evil. The same idea seems to continue through the magic of classic fairy tales like those of the Grimm brothers, in early phantasmagoria like Mary Shelley’s Frankenstein (which sets the pattern for using quasi-science to create magical situations in which to explore human meaning), and in most of the modern manifestations that fascinate us in our age. It seems to me that by the use of magic, whether supernatural or pseudo-scientific, the mundane clutter of daily life can be bypassed so that the underlying moral and mental truths of the world can be seen more clearly. Imaginary magic actually facilitates the perception of deep reality, and people seem to need both one and the other, whether their “core commitment” is religious, secular, or agnostic. The magic of the alchemists could not serve this function, even if it were real – for power is not meaning. Neither, actually, can science as such, for the same reason. This theme is examined in another podcast on the Rupert Sheldrake website (probably the last I’ll mention for now), which is well worth hearing. Similar things are said about the spiritual nature of science fiction to those I’ve been saying, but some intriguing points are made too about the presentation of “popular science”, especially on TV. The visually ravishing and highly narrative presentations in a David Attenborough series on the living world, or a Brian Cox one on the cosmos, are contrasted with the often very superficial science accompanying the images. Sheldrake and his interlocutor note how, into the sense of beauty and purpose the graphics and description have set up, and just as the viewer is beginning to feel, “What a wonderful universe!”, the message is invariably dropped in – “It all came about by chance, and we’re just meaningless specks in it all.” It’s almost as if the whole production is sugar to ease the swallowing of the bitter pill of hard materialist philosophy. 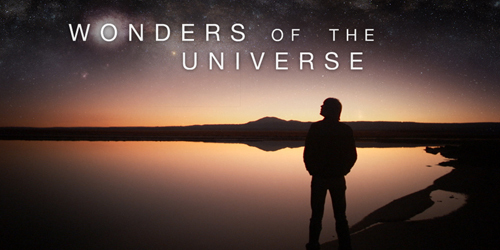 Sheldrake truly remarks that if science programmes represented science as frequently practised in the laboratory – the crunching of numbers by astronomers who never look at the sky and biologists who never encounter a living creature – nobody would watch. Incidentally, there is one BBC radio series, The Life Scientific, that manages to capture some of what motivates real scientists in half-hour interviews – but what usually comes across is the thrill of problem-solving, intellectual or practical, rather than any sense of meaning. In the same way, as a doctor I was professionally concerned with patterns of disease and forms of treatment – but as human beings we are rightly interested more in health itself. The (niche) interest is in what rows the professionals’ boats – not in what our world is about. What interests most people, then, and thrills them when they watch “science” documentaries, is not the science so much, but the nature of the world and, especially, its meaning. Yet there’s a strangely punitive element to these documentaries – “You can have the sense of wonder, but only if you let us exact the meaning of it all as the entrance fee.” The most crusading materialists – Peter Atkins of the National Secular Society, for example – would like us all to mature to a truer appreciation of science, in which we all boldly face the reality of purposelessness, the demolition of free will and mind, of objective morality and, of course, of relationship with God. Then we’ll have come of age as a species. But it seems that can’t be sold to the public without smuggling it into a presentation that is nearly all about transcendance and beauty. Scientism, in other worlds, short changes people on meaning, and one would think that it doesn’t matter, for the world has indeed become more secular, more au fait with science and more prone to concur with the materialist agenda in education, politics and daily life. But magic in fiction gives the lie to it all – there has never been more interest in it, and it still serves the same purpose of stimulating the imagination to grapple with the big issues of what the world means, and why we are in it. In that context, every blog about science fiction by an academic is a sign that we know there is more than science, and that it’s not just fiction. Our family has enjoyed the (I think somewhat recent) TV series: “Merlin”. Of all the fantasies with magic in them that I think were shot through with meaning and philosophy (such as Tolkien’s or Lewis’ fiction), it seems to me that this series was light on underlying philosophy or meaning. Maybe my cursory one-time enjoyment of episodes didn’t do justice to finding what may have been there. But it seemed to me more just spinning a suspenseful tale, much of which was centered on the topic of magic itself and the secret power wielded by Merlin. If you are suggesting that magic provides a medium or backdrop on which a writer can paint and portray meanings worthy of contemplation, then I think you are on to something. When the focus becomes… the magic itself, something important may be lost. I may not qualify as a hard-nosed or high level science researcher, but on the enjoyment of nearly every series you listed … guilty as charged. One can probably glean much by watching how someone reacts to or watches a science fiction piece. Do you express offense when a piece of science is sloppy, unrealistic, or just plain wrong? Or are you the other person who shushes the complainer so that you can get on with the deeper story, scientific incidentals be damned? I’m definitely the former, though if others behaved like I did and couldn’t let it go, I can imagine switching sides, or even be irritated with myself for being that way. … fascinated to “know” end?!!! Sorry about that. I could try to pretend that was a double entendre or something like that to salvage a few scrapings of dignity. But my dignity, too, has passed. Merv, I literally grew up on Sci-Fi – my Dad read little else, and I filched everything he got from the library at a ridiculously young age. I read so little else that I made up “real” novels to put on my school “read” list (sorry Mr Copeland) – I remember being particularly proud of my précis of the entirely imaginary Elephant’s Moon by Norbert Simons. I have “Leibowitz” on my shelf – must revisit it. I’ve drifted away from it in latter years, partly because my wife and kids read literature and shamed me into imitation, and partly because I began to find much of it shallow… probably just before it started to become deep! FWIW I enjoyed Hal Clements because of the motif he had of imagining what inhabitants of an entirely alien world would be like, and working out how real friendships with humans would work out. And I liked James Blish, because I treated his wife once – though his Cities in Space were sociologically silly. My own sci-fi readings have tapered off as well — maybe for some similar reasons that you give; or also because I just don’t take the time to pleasure read any kind of literature now as much as I did in my youth. I’ve never read Simons or Clements. The latter sounds like something my older son would enjoy. I’ll have to see if he’s read it. Some of the old books seem to be free online now – the ones I remember fom Hal Clemets are “Mission of Gravity” and “Cycle of Fire.” Norbert Simons, to my shame, I made up as a plausible non sci-fi author.